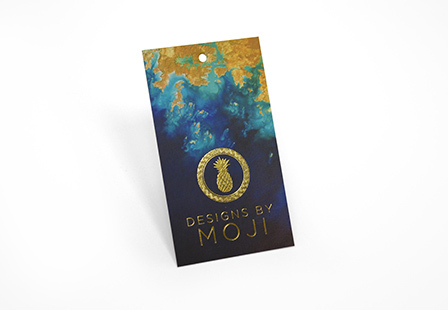 Include stamped foil to your silk hang tags and have your product or business stand out and attract customers. 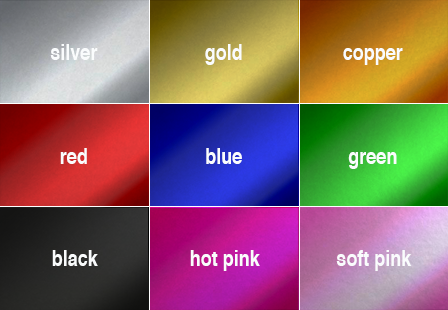 Choose from the following metallic colors: Silver, Soft Pink, Hot Pink, Red, Blue, Black, Green, Copper, and Gold foil. Add Spot Gloss to highlight text, images or design patterns. Available in a variety of dimension to meet your artistic needs. 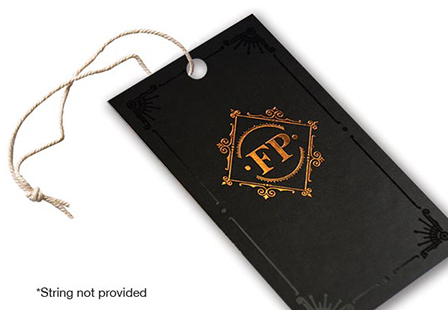 Custom hang tags are perfect for jewelry, clothing, gift baskets and more. String not provided. 1/8" diameter hole. Please Select 1.5" x 3.5" 1.75" x 3.5" 2" x 2" 2" x 3.5" 2" x 4" 2" x 6" 3" x 3" 3.5" x 3.5"